Father's Day is just round the corner and the world is preparing to celebrate this special day ! We're all thinking of or buying those special gifts and cards with beautiful and emotional messages. We think about the times when we were young and our fathers helped us and now we want to give that love back and show our gratefulness. Sadly, there are a few situations in this world where parents are not given the love and care that they deserve. I came a cross this sad, rather horrific news that a 93 year old father was chained by his sons to live on terrace of his own house in Bangalore, India! When you read news like this, you realise how some nasty people treat their parents or repay like this. Fathers day isn't a one day event but something that ideally we should be celebrating 365 days of the year! Did our mother or father ever take a break when we were young? The news is enough to bring shame on humanity! I just want to send message to those people that One day you are going to be old too and Your kids are watching you and they are growing fast too ! Maybe I am not here to take any actions or taking a fight but doing my bit by enforcing right value in my teenage kids ! I'm blessed with so many uncountable blessings from my dad, only one post of tribute is not enough........A Fighter -My Hero, My dad !! My dad has seen very hard time since his teenage days, while I was child never seen or heard of his tough time as my dad would never tell us or show us. He always treated us with so much love, care and got so many things even more than what he is capable of. He always wanted his kids to smile and be happy, no matter how he would live his life ! Last year I went to see him with my daughter , he was talking about his childhood memories, my childhood days which I didn't remember. He was talking about my MUM that how difficult time they spent together and tears rolled from his eyes. He said that no matter how tough was his life, but now his kids are well settled and that brings a great happiness to him. But I insisted to know about his life was when he was working in Mumbai. He told me he had gone through very very tough time in those days, for me it was shocking that many many days he was eating only once or in the evening he would eat only small packet of chana masala to save money so we can get good education , good and comfortable life in Gujarat. I was speechless, didn't know what to do or what to say ! Only I can describe him as " A Fighter " all his life he has been fighting with every phase of his life and still fighting. In the west people retire at age of 62-65, he is still earning his own bread at age of 71, staying alone and still going strong ! Dad is a fantastic cook , and today I am going to share a recipe Chana Masala a dish close to his heart, which he can't get enough of it . 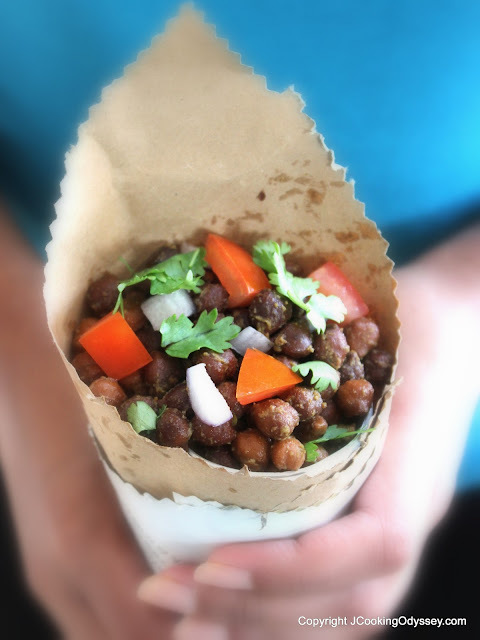 This particular chana dish available in Mumbai at Juhu beach and many railway stations, sold in newspaper cones, although I haven't tried it in India. But by dad's bragging for this dish, felt like I have tasted many times . Clean and soak chick peas in a warm water for overnight. In the morning change the water , add chick peas in the pressure cooker with new and enough water and salt. Cook the chickpeas at least 20 minutes in a cooker. If you don't have pressure cooker, boil chick peas on a stove with enough water for at least about an hour or till chickpeas well cooked. Keep checking the water level. When the chick peas are well cooked, drain the water from it. In a heavy based pan or kadai add and heat oil, add cumin seeds when they splutter add green chillies. Straight away add boiled chick peas with all the masala and powder. Check seasoning and serve chick peas with tomatoes, onion and garnish with chopped coriander and lemon wedges. Enjoy this healthy and tasty dish any time ! I have same story , my mom told me when I was about to come here, even my elder sister didn't know about that part of their life that how they survive in their life , my mom didn't had money while she was pragnant with my sister and she just eat bread and water. Seriously I am crying writing all these and still they gave us all the best things in life. All days are Happy Father's day and Mother's day for us. BTW chana is delicious , i make it as salad. A wonderful tribute to your father, Jagruti! It's a pleasure getting to read about him and these spiced chickpeas sound and look so tasty... I love the mix of ingredients and the presentation! Jag what a beautiful tribute to your dad , he is lucky to have such a loving daughter. Chana masala looks wonderful. Feeling sad for that father ....How can ppl do like this ?? an excellent tribute to a father because of whom we r what we r today. I truly hope all the children on this earth r forever grateful to their parents for what they given them in life by sacrificing their interests and serve their parents when they grow old.